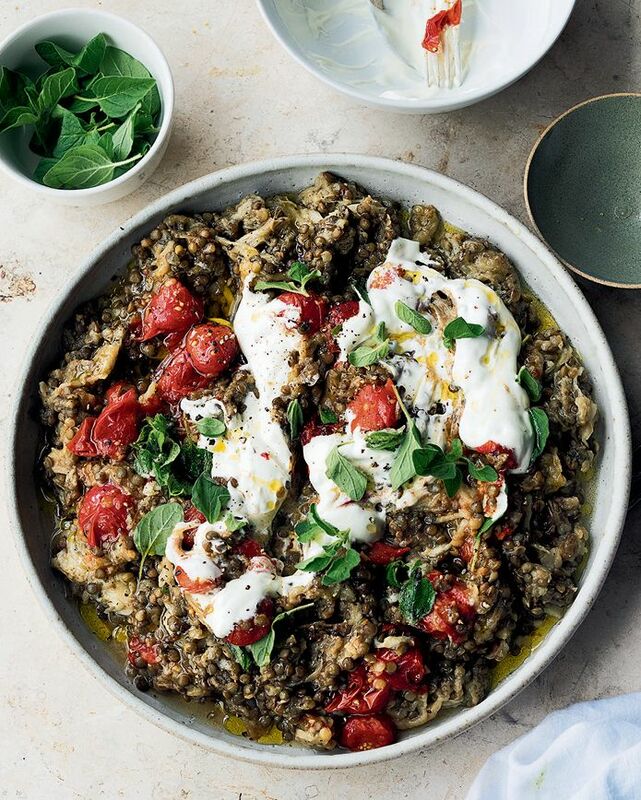 “Few things bring me more pleasure in the kitchen than taking a set of familiar ingredients and seeing them in a new light,” said Yotam Ottolenghi in Ottolenghi Simple (Ten Speed Press). Eggplant can be cooked in so many ways, as you can see in the recipes below. In the first, eggplants are roasted whole in the oven. In the alternative—made with largely the same ingredients—the eggplant is blackened in a pan, then simmered. Either dish can be served as a starter, a side, or over the grain of your choice as a main. Preheat oven to 475 or as high as your oven will go. Roast eggplants on a baking sheet 1 hour, turning them halfway through, until flesh is completely soft and slightly smoky. Remove from oven. When eggplants are cool enough to handle, scoop flesh out into a colander. Discard skin and allow flesh to drain for 30 minutes. Roast tomatoes on a baking sheet until slightly blackened, split, and soft, (about 12 minutes). Remove from oven and set aside. Place a saucepan filled with water over high heat. When water boils, add lentils, decrease heat to medium, and cook 20 minutes. Drain lentils; set aside to dry slightly. In a large bowl, combine lentils, eggplant, tomatoes, olive oil, lemon juice, garlic, 2 tbsp oregano leaves, ¾ tsp salt, and a good grind of pepper. Mix well, then spoon into a shallow bowl. Top with yogurt, swirling it through slightly to leave obvious streaks. Sprinkle with remaining oregano and drizzle with a little olive oil. Serves two as a main or four as a starter or side. In a large sauté pan, warm 2 tbsp oil over medium-high heat. Add garlic, onion, thyme, ¼ tsp salt; fry 8 minutes, stirring. Tip into a bowl; set aside.